Jeep Compass Limited Plus has been launched in India. The top-end variant gets a panoramic sunroof, Auto headlamps and more. The variant starts from Rs 21.07 Lakhs and goes up to Rs 22.85 Lakhs (ex-showroom Delhi). The range-topping Jeep Compass Limited plus variant has been launched in India. It replaces the Limited variant as the top-spec trim now. It comes in two engine options – 2.0 Litre Turbo diesel and 1.4 Litre Multi air turbo petrol. There are total 3 variants of Limited Plus, which include – Turbo Diesel 6-speed Manual 4X2, Turbo petrol 7-speed automatic 4X2 and turbo diesel 6-speed manual 4X4. The Limited plus variant starts from Rs 21.07 Lakhs and goes up to Rs 22.85 Lakhs (ex-showroom New Delhi). Jeep Compass competed with the likes of Hyundai Tucson and Mahindra XUV 500. However, these two SUVs offered much more features than the Compass. Now, Compass Limited Plus gets 8 new premium features. The Jeep Compass Limited Plus gets a panoramic dual-pane sunroof, 8-way Power seat for the driver with memory function and 4-way power lumbar support, 8.4-inch UConnect infotainment screen and Selective Automatic Bi-Xenon headlamps. These features are the segment first features. 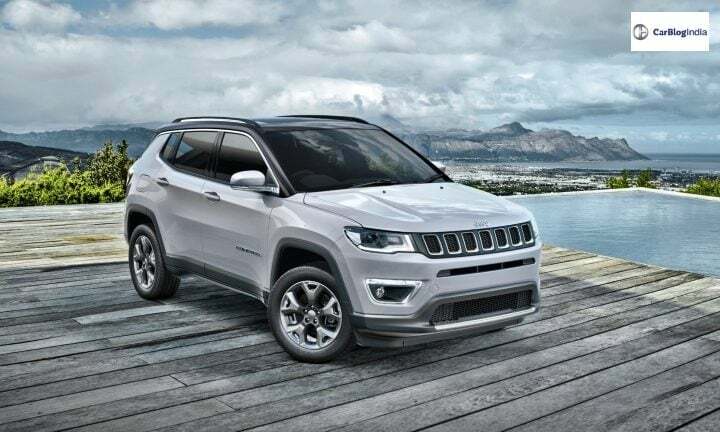 Along with this, the Jeep Compass Limited Plus also gets a new set of 18-inch dual-tone alloy wheels, Six airbags, Rain-Sensing Wipers, and Electrochromic Auto-Dimming IRVM. With these features, it comes a fully feature-equipped SUV. The Jeep Compass Limited Plus comes with the same engine specifications. It gets the 1.4-liter Turbo Multiair petrol and a 2.0 Litre Multijet II Turbo diesel engine. The petrol engine produces 173 BHP of power and 350 Nm of torque. The diesel engine produces 163 BHP of max.power and 250 Nm of peak.torque. The petrol engine comes mated to a 7-speed DDCT automatic transmission and the diesel engine uses 6-speed manual transmission. Other features onboard the Jeep Compass Limited Plus includes LED tail lamps, Reverse parking sensors with a camera, Dual-tone roof colour, Auto AC, Rear Fog lamps, Push button engine start and BI-Xenon headlamps. For safety features, it gets 6-airbags, Electronic Stability Control, ABS, EBD, Traction control system, and an Electronic parking brake. It also comes with an option of 4WD. The features on the 4WD variant include Terrain-select and 4WD transmission. The Jeep Compass range starts from Rs 15.85 Lakhs and goes up to Rs 22.85 Lakhs (ex-showroom Delhi). At this price, its main competitors include Mahindra XUV 500 and Hyundai Tucson. It also competes with some variants of the Tata Hexa. The Jeep Compass recently completed its 25,000 sales unit milestone in June. On that occasion, it had launched the limited edition Jeep Compass Bedrock. The Baby SUV is one of the most popular SUVs under Rs 20 Lakhs.